On June 1, 2017, I had the privilege of giving the opening keynote presentation at the Educational Technology Users Group (ETUG) Spring Jam 2017 “Education by Design” at the University of British Columbia’s Okanagan Campus. My thanks to @etug, Jason @draggin, Leva @levalee, and Janine @jhirtz for the invitation and opportunity. 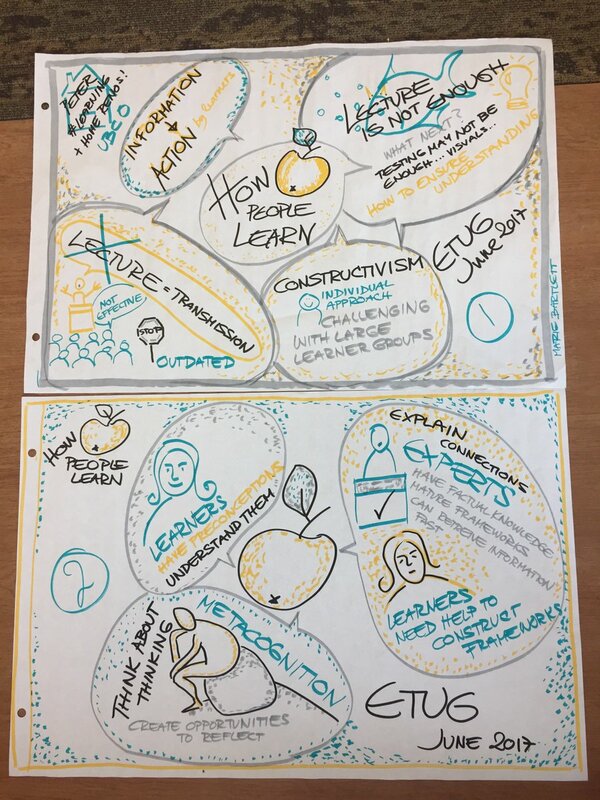 My keynote on how people learn at #etug has #peerinstruction, papercraft, #sketchnotes, tasteful (I hope) PPT animation. Allons-y! Click to download a free PDF of “How People Learn” (2000) from the National Academies Press. It was a great pleasure to interact with the ETUG participants. It was even better because people made #sketchnotes of my talk! In light of recent world events, I want to assure our community that the resources coming from the Centre for Teaching and Learning will always come from a place of respect, equity, and compassion. We are committed to helping UBC educators create welcoming and supportive environments for every learner, regardless of religious belief, sexual orientation, gender identity, ability, or racial or ethnic background. Discussions about society absolutely have a place in our classrooms, in any and all disciplines. UBC educators and students must be able to have critical, scholarly discussions about hatred, racism, oppression, colonialization, and more. These are not easy conversations for educators to initiate or moderate, and the CTL is ready to share our resources and seek out other support if necessary. We are proud to be part of this teaching and learning community. We are grateful for the opportunity to contribute. This is most definitely not the first draft. Or the second. Or the third. The first version was much longer. My boss, the Provost and VP Academic at UBC Okanagan, Cynthia Mathieson, sent back a “less is more” revision. Remarkably, but not surprisingly, all the phrases and sentences I’d struggled the most to write were removed. The ones I wrote easily and with conviction are still here. Imagine that, huh? Several other statements have come from UBC this week, like this and this from UBC President Santa Ono and another from UBC Okanagan Deputy Vice Chancellor, Deborah Buszard. They mention respect, diversity, and inclusion and share the concerns of my campus and my institution. I felt it was important to include compassion, too, because every instructor I know cares about the success of their students. It was important that my name appear at the bottom of the statement. The newsletter comes from my centre so ultimately, everything has my name under it eventually. I wanted it to be explicit, though, so people know this is what I stand for. And to let the campus know this is what they can expect from everyone of the people in my centre. I also want to let the people in my centre know this my expectation for them and that I’ll support them if someone questions their motivation for the support they provide. I deliberately added “ability” to the “regardless of religious belief, sexual orientation, gender identity, or racial or ethnic background” phrase often found in statements like this. Students and educators with different abilities need the same respect, equity, and compassion when it comes to teaching and learning. Oh, and the Oxford comma. It’s now part of my style guide. I use it in emails, documents, and blog posts. Having declared to myself that it’s what I do, I no longer pause at the end of a list, wondering if this is or isn’t a place where I could or couldn’t, should or shouldn’t, add a comma. Saves me a tiny bit of cognitive load I can use elsewhere.